The third word . . . hard. Years ago, I was at Laity Lodge visiting with my old CPE supervisor and he was asking about some of my life experiences. I told him that I had had a charmed life, that I hadn’t really suffered. He smiled sweetly and said, “Oh, I see . . . your hard stuff is still in front of you.” Even now, I would say that it still is. One of the hardest things is to own the parts of this experience that were hard without minimizing it on one hand or being dramatic and self-indulgent on the other. I’m still struggling with that. The waiting was so hardest, as many of you know . . . . waiting for test results and doctor appointments, when the roulette wheel was spinning and hadn’t stopped yet, when we didn’t know how lucky we would be. Even then, I still was present to the reality that someday I won’t be so lucky—that’s just the reality of life—and I’m still learning how to carry that knowledge with less fear and more grace. Experiencing God’s sustaining hand in this experience has helped with that and so has remembering that that’s just part of being human. The MD Anderson experience has been hard too. The women I meet and the stories I hear amaze me with their courage and perseverance—they are women of valor; at the same time, there is a lot of fear and sorrow in that place and I seem to get tangled up every morning in a heavy net of pathos that takes me the rest of the day to get out from under. I’ve also been very present to how much harder this experience is for so many others—it’s harder if you don’t have health insurance, it’s harder if you have to choose between saving your life or saving your job so that your family can eat, it’s harder if you have a chronic illness other than the cancer, it’s harder if you have to have chemotherapy, it’s harder—no, it’s impossible—if you don’t have a loving partner or supportive family or faithful friends. I teach my clients about the power of “and”--the importance of living with the tension of things that are different, even at odds with each other, but equally true, so I’m holding my words in tension: lucky and fascinating and hard. The second word is Fascinating. Every now and then, you have an experience that takes you out of your ordinary life and gives you a ringside seat to a world you don’t know anything about. I experienced that a few years ago when I served on a grand jury for several months and got to see the world of criminal justice up close. This has been a similar experience—there’s a whole world of people and life and experiences there on the corner of Holcombe and Bertner that I never even knew about before. There are two aspects of this world that are fascinating: the technology and the people. Obviously, I can’t share pics of the people but here’s a photo of the machine that I visit every day. In case you didn’t know either, here’s how it works: I have marks all over my torso—red, blue, green, a bullseye, an “x” (to mark the spot) and other lines—drawn with Sharpie and covered with clear tape. When I lie down on the table, green laser-type lights coming from above and to the side have to be lined up perfectly with the marks. Then all the techs leave the room and give me instructions over the speaker to take a deep breath and hold it (that moves my heart out of the way) while the machine moves around my body and makes a buzzing sound. We do that a few times and then I’m done. Fascinating, huh? The most fascinating part, though, is meeting the people who sit in that tiny waiting room. The intimacy reminds me of what it feels like to sit around a campfire where stories are told and deep connections are made. I don’t know anyone’s name but their stories are with me for life and I find myself rooting for them like crazy and carrying their struggle with me when I leave. There are women in this room every morning from all over the country and all over the world. One of my favorite mental images is of a woman from Qatar, completely covered in black, holding hands with a liberal Israeli woman, talking quietly about their lives. That is a holy moment. Another memory is of a woman a little older than me plopping down in an empty chair and announcing, “Today is my birthday. I was supposed to be dead by now. But I came here and they just told me that the treatment is working.” Even though we were all complete strangers, there was genuine celebration and joy in our midst. This has been a fascinating experience because every day it requires me to move outside my comfort zone and enter a world where I am a vulnerable participant and a learner, not an observer or an expert. The learning is rich—about myself, about medicine, about people, about faith. And I get to share this experience with others who are also vulnerable participants and learners. It requires me to trust, to listen, to be curious, to lie still and (literally and emotionally) put myself in the hands of others. I'm not very good at any of those things but I've had lots of practice lately and I'm getting better. 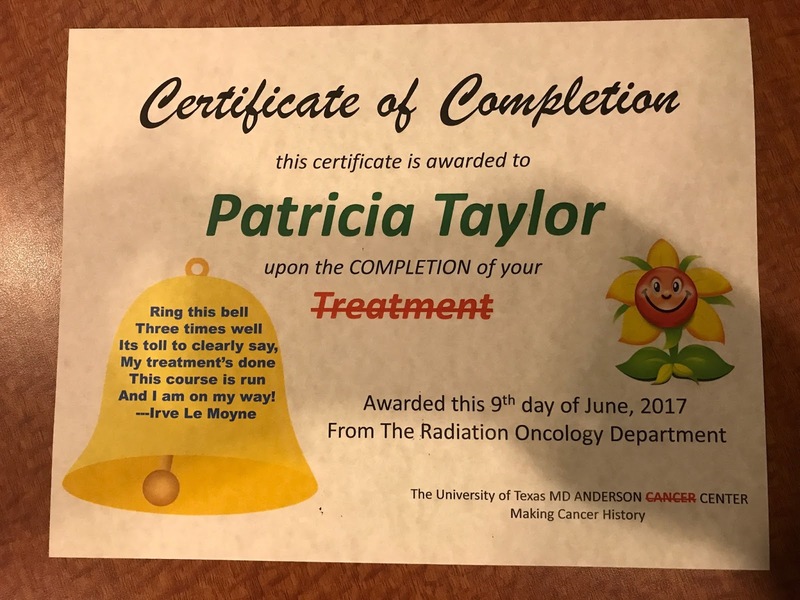 Today I went to MD Anderson for my 30th radiation treatment. 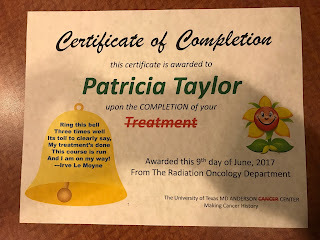 For the last 30 weekdays, I’ve headed down to the medical center, parked in the depths of the massive parking garage and headed up the R elevators to the Radiation Oncology department. Every day, I change into a hospital gown, sit in a tiny room with 7 other women also waiting for their treatments, walk into a thick-walled vault and lay down on a metal table and let the eye of the giant machine shoot radiation into the tissue around my heart and my lungs. Then I get dressed, say bye to all the women who are still waiting and go to work. I’ve been contemplating how to answer all the people who ask me, “How’s it going?” and I’ve come up with three descriptors. Here’s the first: Lucky. I’ve never felt so lucky in my life. It’s impossible to sit with my diagnosis in a room with 7 other women with very different diagnoses and not feel incredibly lucky. I caught it myself. I caught it early—insanely early. My surgery was more involved than I had hoped but it left me cancer-free. I’m not doing chemo. I have my hair. I live thirty minutes from the most hard-core cancer hospital in the world. A friend of a friend got me this spot in this room. I’ve got awesome health insurance. I’m going to be okay. I am incredibly lucky. Some of you are already preparing to leave a chastising comment to this post . . . You’re wanting to tell me that I’m not lucky, that I’m blessed. I get it. I am blessed. But here’s my thinking: I assume (or at least I hope) that I might describe myself as blessed even if I were sitting in the waiting room with cancer in my body, with no hair, with a diagnosis that made my family cry. The fact that I’m not is, in my opinion, not related to the blessing of God but to something else, something less personal. Whatever that is, I’m calling it luck. And every morning, I feel overwhelmingly, pervasively lucky. Something that happens at the corner of the street . . . In the midst of all the cultural unraveling (confusing and disruptive for many), the Spirit of God is up to something profound and important. We are not going to discern what the Spirit is doing if we stay inside our buildings, inside the ecclesial-centric bubble. The Spirit of God is pushing and prodding us out of the zones in which we live into places we haven’t been. It’s where we meet the other and the stranger. We have to engage each other. Only when we show up there do we have the chance to the meet the Spirit and know what the Spirit is up to. Ezekiel goes out to the brook and assumes the fetal position for awhile. Symbol: brook or well is the place where those outside the mainstream religious world gather. Ezekiel struggles b/c he was not trained for that, his imagination was not shaped by that. Exegesis is all about power, control and management. If that is at the core of who you are and how you work, you’ll never be able to engage at the corner of the street. We were shaped by the world map—there was a center and there was a periphery. Your map showed you who was in the center—for us, the US. White, European, etc. how do we get back control? how do we get back the success we used to have? how do we retake the position we used to have in this culture? "If we can get the right demographics, the right strategies and then operationalize those strategies, then our churches will be successful again." Paul is ready to repeat the process that he already knows but we get from the text that that’s not working. So on the Sabbath, he goes outside the gates of the city. Finds the group of women and Lydia. She is a seller of Louis Vuitton bags. What do you do with a woman saying, “Baptize me and set up shop at my house”? God to Paul: you are going to discover what the Spirit is up to out ahead of you and you’re going to be surprised where the Spirit of God is at work. What does it mean for us as God’s people coming out of the Eurotribal positions and embodying a whole narrative of privilege, control and management? Our tendency is to ask strategic planning questions instead of watching to see where God is at work. Luke 10: How do we behave when we engage and enter the neighborhood on the street corner? Never go alone. Go as part of community. You leave behind all your stuff. You go to the street corner with a spirit and a heart and a mind of receiving from another, not giving or meeting needs. [Obviously, there are places where we need to help to meet the needs we see but that is not the posture we take when we go to the corner.] To the extent that I go with attitude “what are the needs here and how do I meet them?” or that I go with a plan, I will be blind to what God is doing on the corner. How do I go dwell with and go among the people where the Spirit is at work? This is not a one-off strategy. Dwelling means staying. For Roxburgh, it meant no longer driving his car. It meant not "getting in a car and driving to a place in a different neighborhood to worship with people who look/act like me and my friends." None of this is new. But we still remain stuck in the “church questions”—where church is the subject and the object. We have to lay down the need to get the church right and fix it and instead dwell in the neighborhood and wonder, “What is God percolating here? What am I hearing? How does that shape my understanding of the church?" Luke 10: Jesus is sending the 70 and says to them, I want you to go in such a way that you become dependent upon the people to whom you are going. “Stuff” means living and dwelling in a way that helps me increasingly not be an independent self that has everything I need. Invited to a journey of discovery of "how do I learn to not be a completely independent human being but begin to build a life of engagement with the folks in my neighborhood or at the corner where I am more and more receiving from them?" Jesus is asking the disciples to actually join the community—the social and economic life of the community. If you go with your credit cards, you’ll never get to that place. To Roxburgh, this isn’t about affluence and non-affluence but is about community and participation. This is not about ideas. This is about ways of life that we embody in our bones and muscles and don’t even think about. I have places I like to go and ways I like to do things. My car is the way I stay in control. Those of us who do church for a living are constantly thinking about church—it’s always going on inside of us, we don’t have to make a mental decision to think about it. Missional living is a journey of learning to change those deeply embodied practices and habits. In the midst of the unraveling, all of us want to stop the unraveling and hold on to our comfort zones. As Americans, we are a people who were formed on ideas formed in the European Enlightenment. At the core of that way of thinking is this deep conviction that there is a method and that method can be used to solve any problem. John Dewey: “pragmatism” Houston, we have a problem. We will bring the best and the brightest together and we’ll take the elements of that problem and we’ll work on it until we solve it. That has been a gift to the world . . . but what do you do when the Spirit of God says, “You can’t know what I’m up to if you play that game.” When the Spirit creates sufficient disruption that our strategies take us further away from what the Spirit is up to. But our starting place is “What does this mean for the church?” and “When I get back to my church, how do I do this?” Missional living is not about a new tactic. That doesn’t mean stop what you’re doing. The dumbest thing you can do in the midst of a world that is coming apart is to go back and say we have to stop what we’re doing and change everything. Challenges around identity: Instead of Reformation, use “reformations”—they were Eurotribal fights of the age. But coming out of that is this whole sense of identity (who are we? Who is in and who is out?) and a new narrative about the gospel. Jesuits never talk about their identity: they are formed around a liturgy and a set of practices and everything else is marginal. Identity: a group of people who confess Jesus Christ as Lord and gather around a eucharistic Table and a set of practices (Daily Office, etc.) that form us. If you’re being formed this way, then the question of identity is irrelevant. I can engage and adapt with the people I’m with in a way that “fills out” that core identity. Once you’ve defined church in this way, then you need professionals to run the thing. What if Church is not a building we go to but a tent we take with us? Abram and Sarah. Journey of trust where they cannot tell you the goals, the outcome or the product. What are the practices? We dwell in the texts, attending and listening to the way in which people are entering that dwelling. We church professionals are learning to attend and listen to others. What we are doing is cultivating the space where nonprofessional people are articulating and listening to God through the “other" that they’re with. This is the beginning of discernment. Begin gently learning to hear God through one another in the dwelling in the safe space where God’s people are gathering together. The core of the Eucharist is that it “earths” the Christian story—makes it local and practical and ordinary. How do you let go of church questions? Start where people are, not where they’re not. Don’t go in and start teaching them, “We have to be completely different." Instead gather a few people and begin to take on new practices and learn together. Most of the people in our churches, including ourselves, understand God not as the primary activator in the world but as a useful means to the strategies and directives that we’ve created for ourselves. We have to let go of God being useful to us. When we ask the question, what am I looking for in missional living? we are saying it’s a whole relearning of a set of practices of a way of life. " Learning is how you embody a way of being in the world.” Learning is an invitation to wake up. In this process, we are not pastors, we are not priests, we are abbots. In the 30s and 40s, Barth and others were trying to say that God has a mission and the church participates in that mission. New western realization about missio dei. Newbigin comes along after the changes in Europe where the church is no longer the center of life and Xn presence and influence has all but evaporated.The question: Can the west be converted? Even the language “the west” is Christian. Civil religion. Question about how the gospel reengages and shapes the peoples of the west?